On April 9, 2002 Helen Thorgalsen and Bonnie Clement bought Meserves Market with the vision of creating a warm, friendly and inviting old fashioned general store. They changed the name to H.B. 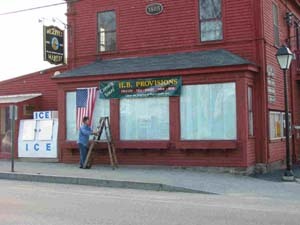 Provisions (from their first initials, Helen & Bonnie) and began the job of recreating and rebranding the store. They removed everything from the store and brought in all new shelving and displays followed by installign the deli and all new inventory. 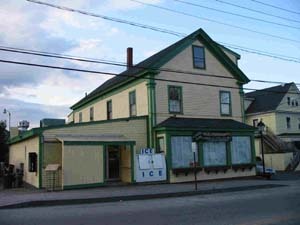 The most obvious change was painting the building a new, happy yellow color and the trim accented with green and maroon(wow, what a beautiful old building) On May 21, 2002 they removed the paper from the windows and the customers came roling in! 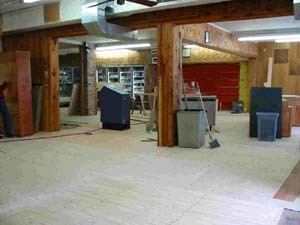 The empty store with the new floor installed. Meserve's Market the day we bought it. Putting our name on the building for the first time! H.B. Provisions one week later! In May of 2007 Helen and Bonnie decided to part ways and later Bonnie became the sole owner of the H.B. Provisions. Although they still remain life partners they found it was much better to have just one owner of the store. Now in 2013 H & B have tied the knot and are partners in life and Bonnie continues to run the store! H.B. Provisions is thriving today as the 'HUB" of Lower Village where friends and family gather all year long. To provide outstanding food and great products in a warm and friendly environment. Create a friendly, warm environment where customers feel a connection to H.B. Provisions that extends beyond the products. We believe that community involvement creates brand loyalty. Serve only the finest and highest quality products on a daily basis. A commitment to quality that is daily and ongoing, using the question "Am I proud to serve this to our customers?" as our Golden Rule. Provide uncompromising customer service to every customer every day. Create a positive work environment where our employees are proud to say they work at H.B. Provisions. Exemplify an excellent partnership with our vendors where integrity, accountability, and striving for excellence are our goals.